Startup problems? See further down this page. 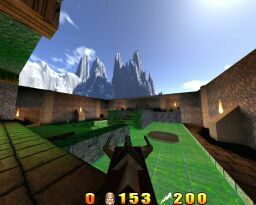 JoeQuake is a Quake client written by Jozsef Szalontai. It has numerous graphical effects, advanced demo playback features (like Rewind), ability to output demos to AVI movies and more. There are 3 builds of JoeQuake available: GL Build (joequake-gl.exe), Win Build (joequake.exe), and a Linux GLX version. 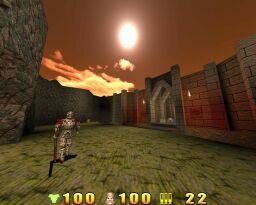 The Win build has many of the features of the GL build (demo menu, maps menu, non-graphical improvements), but most of the graphical improvements are not available. 1. Support for high resolution 24 bit color textures, skyboxes, charsets. 2. 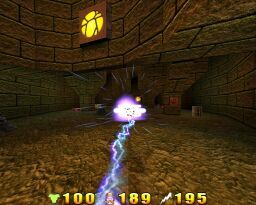 Uses the QMB particle engine for explosions and effects. 3. Demo play menu, ability to convert demos to AVI. 4. Maps menu makes using custom maps much easier. 5. Supports custom crosshairs and item textures. There are many more features, the above is a partial list. If using zip format, put pak0.pak in c:\quake\joequake folder and everything else in c:\quake otherwise you will get a GFX.WAD error. The installer won't allow you to mess it up. Additionally, do not use -game joequake, this is unnecessary, just start JoeQuake as you would the original. Things will be added to this list. Yellow No. 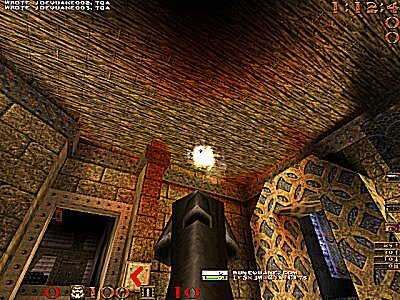 5's Texture Pack includes 531 textures, monster skins, weapon models (Plague's Pack) and textures from various sources including the Quake Retexturing Project. Looks very cool. 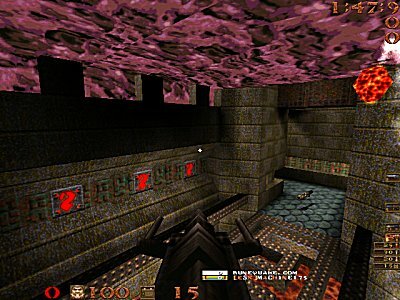 The Quake Retexturing Projects textures are very faithful to the original ID Textures, they just look a lot better. Other useful downloads can be found in the forum, including zipped versions of the above files. How to enjoy Joequake/Qrack to the max! by Ranger. Last edited by Baker on Sat Dec 12, 2009 2:41 pm, edited 14 times in total. If you are using JoeQuake for the first time, it is HIGHLY recommended that you copy your CONFIG.CFG in your Quake\id1 folder and copy it to your Quake\JoeQuake folder. You can go to options and the goto the console (green arrow) or even better ... do the reset controls and the tilde key will again be bound to "toggleconsole". This is a little awkward, it would be better if the "~" key were bound to toggle-console if no config is present, but all versions of Quake do that, the only difference is that JoeQuake isn't looking for your config in the traditional place. Last edited by Baker on Thu Oct 06, 2005 2:41 am, edited 1 time in total. This is a temporary and imperfect FAQ. I wanted to get some critical information here for now. If it wasnt for Baker, my head would explode! 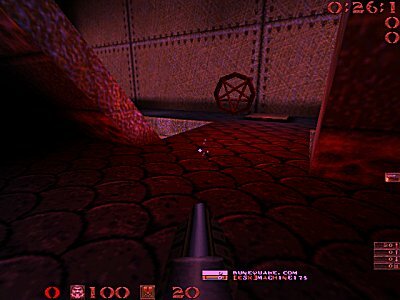 But whats with the hud it looks like quake 3 also the weapons are quite far foward then normal how you do this? The field-of-view is set to something other than 90 (default), like FOV 110. So you can see more, but there is a little bit of the fish eye effect. The weapon can be pulled back using a r_viewmodelsize less than 1, like r_viewmodelsize .75 so it still looks normal. 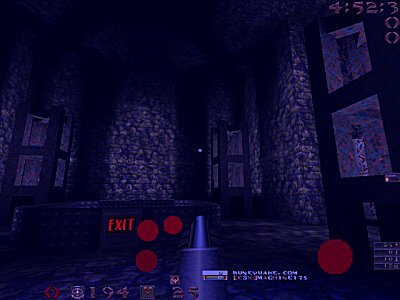 No i ment how come he has that quake 3 hud and i don't and what is up with your hud? also that lightning gun model from that weapons pack how do you get it to work? cause i put it in progs and rename the file and change the extenstion to .mdl but it's still screwed up. I'll start a new thread and explain a little about the HUDs and the use the red Lightning gun as an example too.